At Christmas, the figure I latch onto — the one who means the most to me, and who even through my conversion process has never felt far from me — is Mary, the mother of Jesus. The little babe, lying in the manger? He’s the centerpiece, certainly, but her sacrifice is far more compelling: to bear a god, to brave the opprobrium of her community as an unwed mother, to watch her son grow to manhood only to suffer and die as a common criminal, and to steadfastly care for and support him throughout his increasingly strange behavior and eventual death? That, I contend, is true strength and power. That is divinity. And so even as a druid, I continue to honor Mary. Now, though, I honor her not as the mother of Jesus, but as one of the mothers of us all. 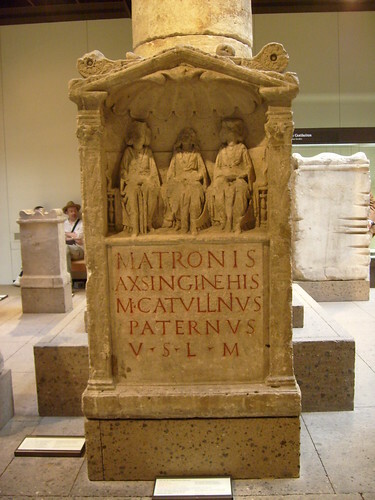 There is a group of figures worshiped throughout the Celtic and Germanic lands that scholars refer to collectively as the Matres and Matronae (“mothers” and “matrons”), from the names they are given in votive inscriptions dating from the 1st through the 5th centuries CE. They are consistently represented in threes, a holy number. The names they are given include Roman, Germanic, and Celtic elements, showing the differing origins of their supplicants. Clearly there was a good deal of culture-blending at play during the period for which we have evidence, and so I don’t have any pause at folding Mary into their lot. 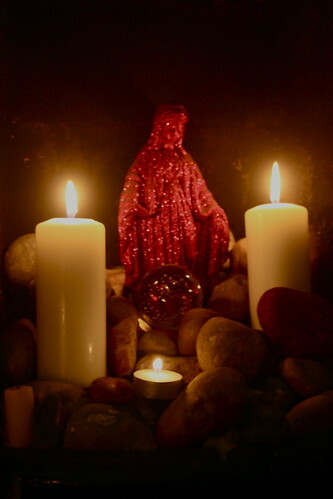 She is a mother, the first divine mother I ever knew, and I am honored to have her watch over me. It’s not only because of Mary, however, that Christmas collides with the Matronae. 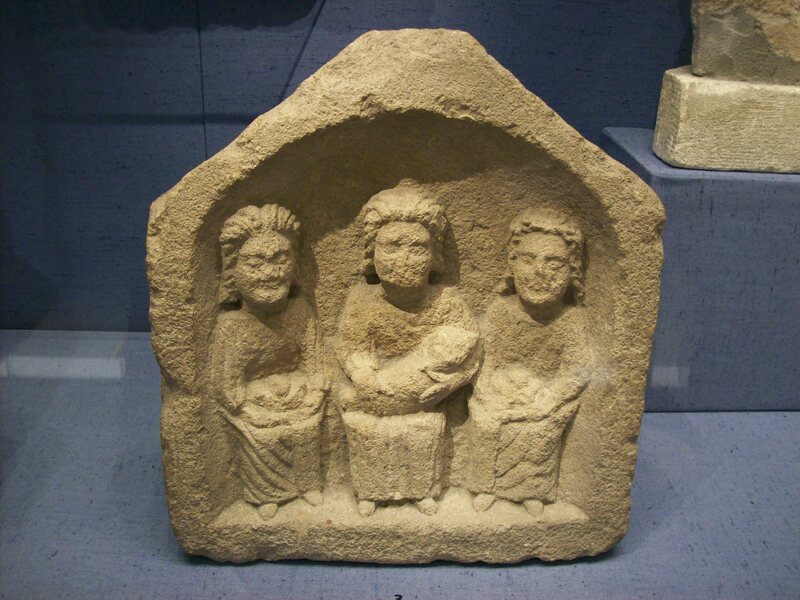 The Venerable Bede, a Northumbrian monk of the seventh and eighth centuries, writes of the pre-Christian Anglo-Saxons “That very night [December 25], which we hold so sacred, they used to call by the heathen word Modranecht, that is, ‘mother’s night’, because (we suspect) of the ceremonies they enacted all that night” (De temporum ratione, trans. Faith Wallis). The night of the birth of Jesus is also, for those of us who worship them, the night of the Matronae, the mothers of us all. I first celebrated Modraniht a year ago. Before heading out to Midnight Mass with my family, I put together a small bowl of offerings — nuts, dates, candies, in groups of three — and I left them at the fenceline behind my parents house. That night, I prayed for two dear friends who were expecting a baby, but were going through a difficult time. (Their daughter is happy and healthy, so I guess it didn’t hurt!) This year, after we’d come home from services and everyone else had gone to bed, I again gathered up offerings: a cookie, divided in three, work of my husband’s grandmother’s hands; three pieces of pineapple, symbol of hospitality in my Southern homelands; three candied peanuts, work of my own hands; and a small glass with three pours of wine. In the darkness of the patio, I held up the plate and cup and asked the Matronae to accept my offerings. I explained that I didn’t feel comfortable leaving them outside, and asked they understand my eating of them as a sign of respect. With each morsel, I prayed: that our godson walk in their protection; that my mother-in-law, missing her own mother on this holiday, be comforted; that my husband and I discern the right path in our own journey toward fatherhood. But as I prayed, I became more and more overwhelmed by my own confusion and hurt trying to straddle Christmas and Modraniht, family and self, and I found myself reduced to a crying child, praying for comfort. I’m well aware of posting this on the civil New Year: may this new year bring us peace and joy, and may the Mothers guide and protect as we travel old and new ways forward. Posted on January 1, 2015 January 1, 2015 by Mike BierschenkPosted in Rituals, TheologyTagged Christianity, interfaith, Mary, Matronae, Modraniht. beautiful. I’m glad you found the right way to honor them!